San Diego  Ask someone where San Diego’s Gaslamp Quarter is and what’s in it, they’ll likely know. So too for Little Italy, and to a lesser extent, East Village. The Columbia District? Not so much. Emmes, which owns five buildings downtown including 1 Columbia Place at 401 East A St., and 2 Columbia Place at 1230 Columbia St., has joined with other neighborhood property owners, retailers and residents to form the Columbia District Foundation with a goal of energizing the neighborhood and making it a place that stands out. Columbia is the downtown San Diego neighborhood south of Little Italy, bounded roughly by Pacific Highway to the west, Ash Street to the north, E Street to the south and Union Street to the east. For many years, Columbia was mostly a collection of vacant spaces, often used as street-level parking lots – a place that people walked through but really didn’t think about. “The neighborhood just didn’t seem to have a lot of character,” said Eric Jones, foundation president and president of Urban Real Estate Services. It’s most distinguished feature was the Santa Fe Depot at 1050 Kettner Blvd. That’s changing, with construction of such projects as Bosa Development’s Pacific Gate and Savina luxury condominium towers, the Carte and Intercontinental hotels, and the $1.5 billion Manchester Pacific Gateway along the waterfront. According to the U.S. Census Bureau, 1,674 people live in the Columbia District with a median age of just under 50, compared with a countywide average of about 44. 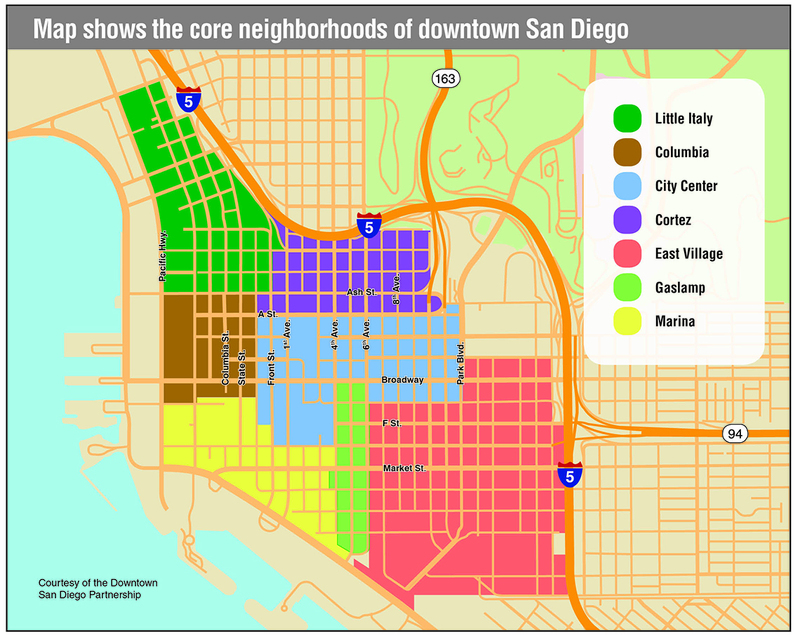 In forming the Columbia District Foundation, Takara said Emmes and others looked for their inspiration to the north at what’s been happening in Little Italy, where the neighborhood is booming with an active nightlife, a plethora of retail shops and restaurants, and a reputation as the new hot spot in downtown San Diego, rivaling and the Gaslamp Quarter. Once San Diego’s red light district known as the Stingaree, the Gaslamp Quarter shed its less savory reputation in the 1980s and 1990s as property was redeveloped, buildings renovated and trendy up-scale restaurants, nightclubs and hotels moved in. Little Italy underwent a similar transformation that started in the 1990s following the decline of the West Coast tuna industry and continues with construction of new residential and office projects and an ever-growing dining and retail scene.